My Dad Person Has An Owie! Whew, today has been a rough one. 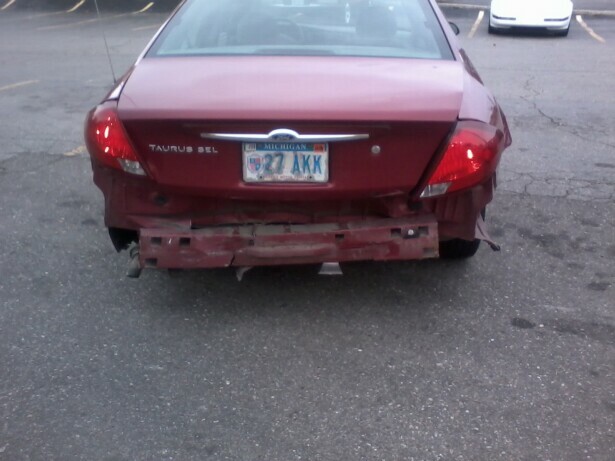 My mom person I got waked up with a call saying my dad person was in a car accident. He’s OK, but his back is hurting pretty bad. I’m laying with him to help him get better faster. Here is what his car looks like. 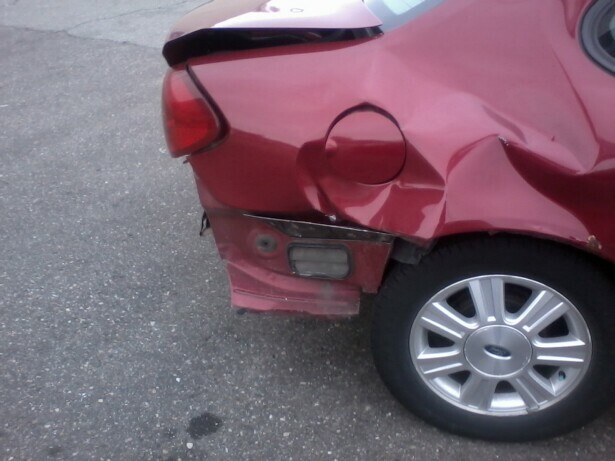 I guess the car is damaged pretty bad, but it’s ok, cause my dad person is going to be ok. I don’t even mind that I didn’t get any oatmeal and ham this morning. First of all I want to thank JD, Max & their female human Clare for all their hard work on behalf of Shelby. They & everyone who donated raised an amazing $1,215.00! I couldn’t be prouder of them! 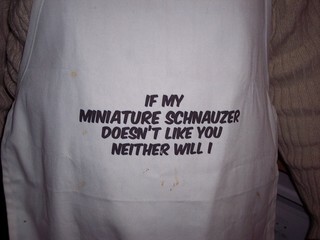 A long time ago they sent us an amazing care package and we just had to show you the apron they sent. My dad person wears it all the time. 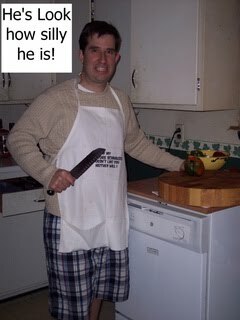 Here he is pretending to chop up a red & green pepper. Here’s a close-up of what it says. You can see that it’s dirty cause he uses it whenever he cooks. He says he’s sorry for the silly outfit, he didn’t know my mom person would demand a picture. Now he knows how I feel! Hi Friends! 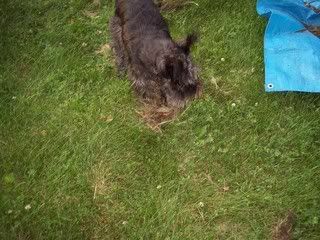 Missing Oskar here! We’ve had more computer troubles. Who’s in charge of these things? Aren’t they supposed to make our lives easier? Anyway, this is a party weekend here at Casa De Oskar cause it’s my dad person’s birthday!!! He’s 41 which seems old to me, but my mom person is almost 43 so we’re not allowed to say that 41 is old. Am I the only one who doesn’t “get” people? 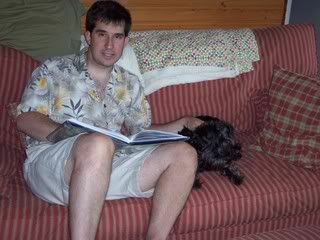 Here’s me and my dad person. Of course Chloe saw the camera come out & decided she should be included too, hmph! For his birthday my dad person got 3 flowering trees. 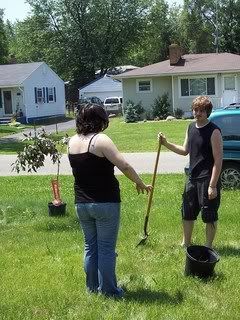 My oldest boy John works at a garden center so he arranged very nice trees and even planted 2 of them. 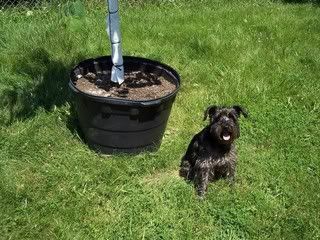 The 2 he planted were in the front yard, so I was not allowed to go out & supervise! 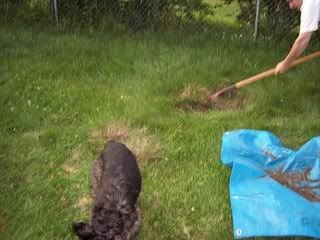 Who in the house knows more about digging holes than me, ya know? Anyway you can see one of the trees & John & his girlfriend Leighanne. After my dad person got home yesterday & saw the 2 new trees that John planted he went into the back yard & saw the third tree that hasn’t been planted yet. 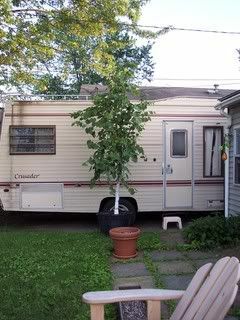 Look how huge it is, it’s way taller than our motorhome! Look how huge around the bucket is. 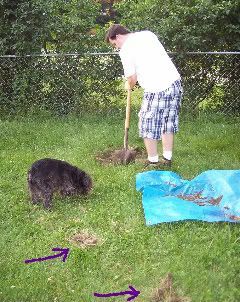 My dad person has to dig a hole that deep & twice as big around!! He started on digging the hole last night. Finally I can supervise! Wait up! 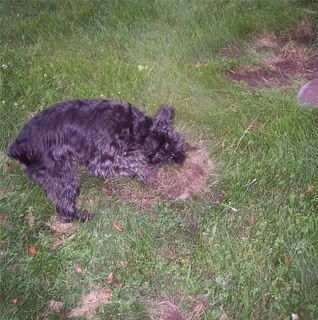 Okay, my dad person wants the grass clumps in one pile and the plain dirt in another pile. I’m not really feelin’ that method. 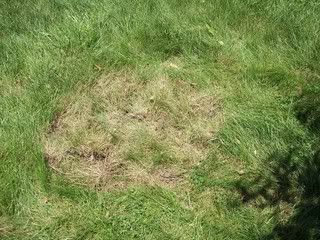 You can see that I’ve spread out grass clumps over a larger area. It’s really more effective this way. 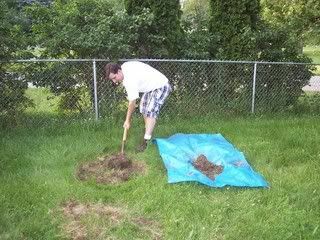 Some of the grass clumps are tricky and and must be wrestled into submission. Whew. Wait…what are you doing?? After all of that work I did, they filled it in! I guess my dad person hit something called roots & has to dig a new hole. 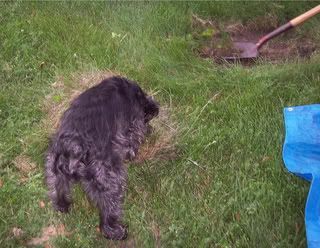 I tried to tell them that once you get a hole dug, you don’t fill it in, you just move onto the next hole, but no one listens to little old Oskar *sigh*. Click to see what all the other Camera Critters are doing. 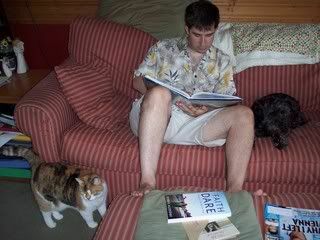 Click to see the other Pet Blog Hoppers. If some of these pictures are showing up gigantic, we apologize. We re-sized them all, but some are showing up HUGE on our monitor.